If I am a Current Member of Rock the Shot Do I Need to Join Again to Access All the Goodies? Nope!! It is all there just waiting for you to log in and enjoy! If you are close to the end of your membership, you can take advantage of the special pricing by cancelling your old membership and signing up for a new one! Was Pretty Forum Always Part of Pretty Presets? Pretty Forum (formerly Rock the Shot) was part of Pretty Presets since almost the beginning. Unfortunately, no one really knew. We decided to move all of the sites together (you’ll see it at the top of all 3 now). It has always been a paid forum though. It just got a new look and name to make it more obvious that Pretty Presets, Pretty Actions and Pretty Forum are all one company. Where Do I Find all the Treasure Chest Freebies? What is Included in the Treasure Chest? There is so much goodness in the Treasure Chest, but I think this image says it best! 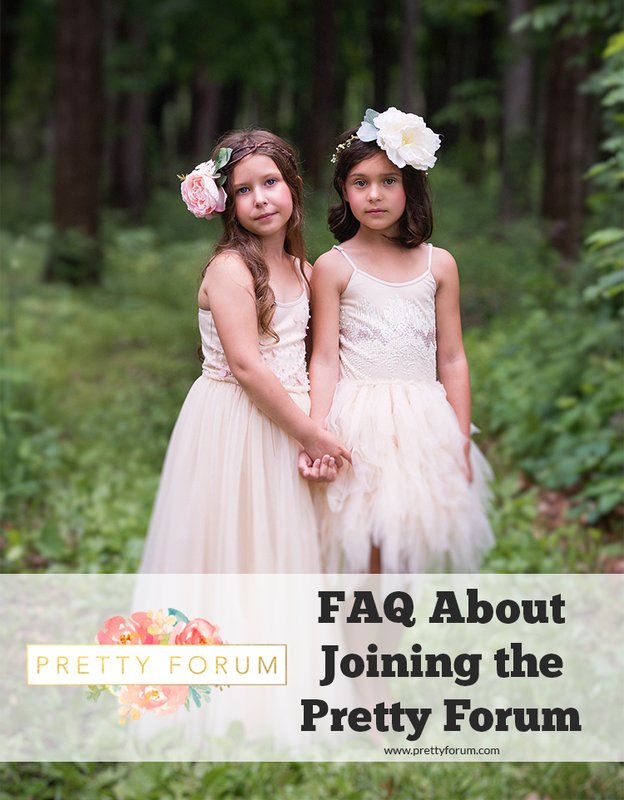 What are the Benefits of Joining Pretty Forum? There are so many advantages of joining the forum! The biggest one right now is that you are joining and getting something in return just for joining. The downloads you get are a huge value. There are 2 sets of Lightroom presets, a Photoshop actions sampler set, a posing guide, and a few other goodies. The cost of one preset collection is more than the cost of membership so it just makes sense. In addition, you’ll be in a community where you can discuss anything you need help with, want to share with others or just want to read about! You can literally spend hours in a forum reading threads that are specific to what you want to read about. We will still totally have the group here on fb and that doesn’t change at all. It’s like giving you a drink of water vs. giving you the entire water bottle. That drink will hold you over and be what you need for now, but that full water bottle is going to get you a lot further! I m Just a Hobbiest/Amateur. Is the Pretty Forum Worth it for Me? The value in the Treasure Chest makes it worth it for EVERYONE to join the forum right from the beginning! Even as a hobbyist or amateur, I imagine you would want to improve your knowledge or skills, right? Photography is something that you are constantly learning about and developing your own way of doing. The forum truly is for everyone. Moms, students, wives, hobbyists, just starting out photographer and seasoned photographer. It is a way for you to constantly be learning and growing your skills. It can be a source of inspiration and different ways to look at the world around you. Growth as a photographer isn’t limited to just professionals—everyone needs encouragement to grow their talents! The Cost of the Forum is $59 Now. What Will It Be When I Renew? The cost at renewal will be $59 for 12 months and $39 for 6 months. We all are so quick to spend a few dollars on a latte or frappe! Why not invest less than that in something that can help us grow our talents, skills, and business. The renewal will happen automatically through your PayPal account. You’ll want to be sure to cancel your membership before the year is up if you aren’t wanting to stick around. You can cancel your membership at anytime, and it will no longer renew, but you will have full access until your subscription ends. It is our goal that as you enter the forum, look around and participate, you will find so much value there that you won’t have any problem renewing your subscription! What Will Happen to the Pretty Presets for Lightroom and Pretty Actions Facebook Groups? The communities we have created on Facebook will still remain there just like normal. We love those communities and the encouragement and support they have been to so many! We really feel they are a valuable resource. However, because we love them so much, we couldn’t rely on Facebook to maintain them. Things change so often on Facebook. We might wake up one day and find that groups are gone, or that the conversations there are no longer shown in news feeds. And just like that, this wonderful place where we have all learned and grown together is gone. Hopefully that helps you understand why we are so excited about this. « Why Join the Pretty Forum? This is great and I’ve signed up! The one thing that I’m not too keen on is that you will charge my paypal account automatically when it’s time to renew. I don’t know where I’m going to be in a year from now or how I’m going to like it yet. Will you give me a warning that it’s time to renew so that I have the option to cancel before it renews? I sure hope so. I look forward to this forum and all it has to offer 🙂 Pretty Presets has definitely been the most helpful tool for me since I’ve started taking photography seriously, and I thank you and your team for all the wonderful help they have provided me with. I am very grateful that I stumbled upon your facebook page! If at anytime you would like to cancel your recurring subscription, you may do so through your account panel. 2) Under the “Your Payment History” tab, you will see your current subscription level. You may click on the “cancel” link to end your subscription. Alternatively, you may also cancel your account directly through your Paypal. You can cancel your recurring membership at any time, and your account will remain fully active until your current subscription ends. I currently have LR4, Im worried if I join, the presets will only be for versions I dont have and will miss out getting to use them. The presets included in the Treasure Chest work for Lightroom 4, 5, 6 and CC. In addition, the knowledge you’ll have access to in the forum is incredible. We hope you join us! If I am currently on the membership that is paid every 3 months will that still be available or will I need to change? Thanks! I don’t use Paypal. Is that the only way I can pay for my membership? I have been thinking about joining. I see that there are times that you are chatting in the forum about wonderful topics. Are thoes always available to go back and read or just for that time? That’s one of the huge benefits of the forum. The topics never go away and are available for you to read and post within on an ongoing basis. Super easy to find tons of info on topics you are interested in using the search bar too. 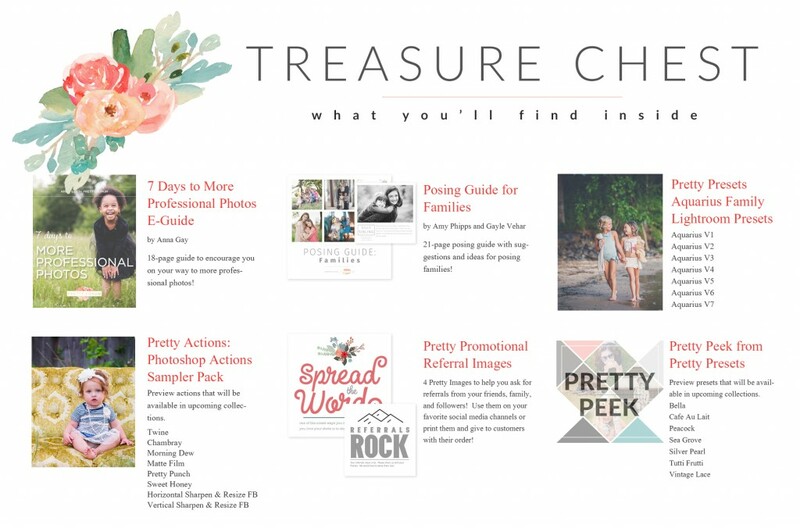 Do all the pretty actions on the treasure chest work with Photoshop elements 14? Yes, the Actions are compatible and will work with PS Elements 14! When will you have more workshops available? The next workshops will be starting in 2017 right after the holidays!